The company boasts that it's the most compact and lightest BDXL burner on the market today. Pioneer's new BDR-XD04 is, according to the company, the smallest and lightest BDXL burner on the market today. It's touted as a portable player that's equipped with a few nice features. First and foremost is the concern of write speeds. If you're burning to a dual-layer Blu-ray disc you're going to get 6x speeds while triple and quad layer discs will slow things down to 4x. You can also write to DVDs and CDs of course, but no information is given as to the speed there. The BDR-XD04 offers PowerRead and PureRead2+, both technologies designed to eliminate problems caused by fingerprints, dust and even minor scratches. 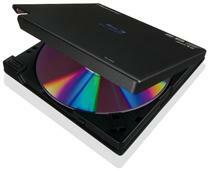 The pair of features make discs more readable and help to eliminate popping sounds on discs. In addition to the disc reading features, you'll find Auto Quiet mode, which slows down the rotation speed while watching Blu-rays and DVDs to keep the drive nice and quiet.